Booked your tickets to Bali? Use this sample packing list to get ideas for what you should bring to Indonesia's most popular island and what you should wait to buy after arriving. No one packing list is perfect for everyone, so tailor your own list to match specific travel plans and needs. 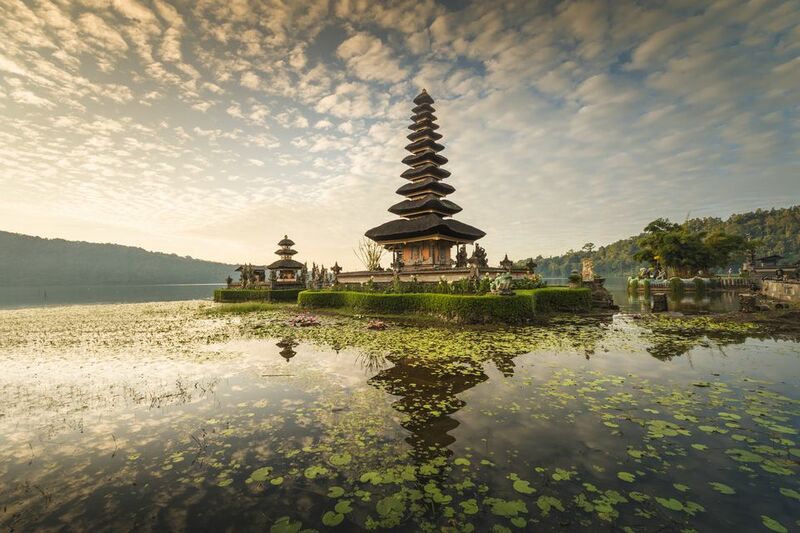 You won't need much for your trip to Bali, and if you forget something, you'll most likely find it available for purchase locally anyway -- Bali is hardly a deserted island! Instead, pack like a pro; bring less and take advantage of unique shopping experiences on the island. You'll have even more of an excuse to pop into the many boutique shops for beachwear and other items that will look good at home, too. While vacationing on an island certainly encourages skimpy beach attire, locals dress quite conservatively. You should cover your knees and shoulders when visiting Hindu temples, sacred sites such as the Elephant Cave, or when exploring small villages in the island interior. Beach attire is fine for daily wear other than when dining or clubbing at pricey establishments. Cover yourself up before stepping off of the sand! Aside from some public transportation with super-powered air conditioning, you don't have to worry about being cold while on Bali. Opt for light cotton clothing; jeans will be hot and heavy for most circumstances. High-tech, quick-dry garments will work, too, but don't leave them hanging to dry somewhere they could be stolen. You won't need as much clothing as you would expect; keep your packing simple and purchase items locally if you run out of outfits to wear. If on an extended trip, you'll find plenty of places that do laundry for a fee based on weight. When packing, separate clothing and other "kits" into sealed modules or cubes in case temperature and pressure changes pop open bottles. As with most of Southeast Asia, the standard-issue footwear for Bali is just a pair of reliable flip-flops. Some shops, temples, bars, and restaurants may ask you to remove your shoes at the door. Flip-flops are easier to slide on and off than sandals with straps. Opting for more expensive footwear may encourage someone to upgrade their own by "trading" for your shoes without asking. You can purchase cheap flip-flops in shops and stalls all over the island. You'll need proper hiking shoes or sandals if you want to climb Mount Batur or Gunung Agung. Some of the pretentious, high-end clubs in Kuta and Seminyak may enforce dress codes that prohibit sandals and flip-flops. You don't want some annoying ailment to affect your precious time on the island. But at the same time, you don't want to carry more medical supplies than a Green Beret medic. Fortunately, walk-in pharmacies sell nearly everything that you'll need -- including prescription drugs -- without the need to visit a hospital first. Pack only a small, simple travel first-aid kit with basics then purchase the rest if necessary. Hopefully, you won't need anything more than an ibuprofen or two after too many beach cocktails. Tip: Every first-aid kit should have anti-diarrhea medicine such as loperamide (Imodium), but don't take it unless getting to a toilet isn't an option (e.g., you'll be on transportation all day). Antimotility drugs may exasperate simple cases of traveler's diarrhea by trapping bacteria inside instead of allowing it to pass normally. Make two copies of your passport, travel insurance papers, receipts for any traveler's cheques, and other important travel documents you should have on every trip. Diversify your copies by hiding them in both your money belt/day bag and big luggage to avoid disaster if one or the other gets lost. Hide credit card information (scramble the numbers in a way that only you understand) and emergency contact phone numbers in an email to yourself in case you need to contact banks. You'll want to bring along a few additional passport-sized photos with you if you intend to apply for tourist visas to visit other countries in Southeast Asia. Bali has plenty of Western-networked ATMs, however, bring backup cash just in case the network goes down. Consider bringing a few traveler's cheques and some U.S. dollars that can be cashed in for emergency funds in case your ATM card is compromised. Tip: Should you lose your passport, having a photocopy of it and your birth certificate will greatly expedite getting a replacement from an embassy in Southeast Asia. You may want to bring along your smartphone, tablet, ebook reader, or even a laptop for taking advantage of free Wi-Fi in cafes and guesthouses. If you opt to bring fragile electronic devices, know how to protect them in a tropical environment. Indonesia uses the round, two-pronged, CEE7 power outlets common in Europe. Voltage is 230 volts / 50 Hz. Unless you intend to carry a hair drier (don't! ), you won't need a step-down power transformer because most device chargers (e.g., mobile phones, laptops, etc) handle the higher voltage automatically. Although many hotels have universal outlets that work with many cord types, you may need a small adapter to accommodate your device. Tip: You can purchase a relatively cheap 4g data package for your smartphone after arriving. See if your cell phone will work in Asia beforehand. Small knife for enjoying fresh local fruit on the beach. Small padlock for use in guesthouses where security lockers are provided. Hand sanitizer and toilet paper for encounters with public squat toilets. Earplugs or an MP3 player in case you end up with a room to close to the party. Mosquito repellent to protect yourself from mosquitoes that could carry dengue fever. Torch/Flashlight for unexpected power outages -- a common occurrence in Southeast Asia. Purchasing what you need on a trip after arrival not only helps the local economy, it's fun! Leave room in your luggage for new purchases and unique items not easy to find at home. You'll find plenty of shopping in Bali, particularly in Ubud where lots of boutique shops carry unique clothing that is perfect for the island. Along with stalls and small shops, you'll find several large shopping malls in Kuta with name-brand items. Outside of malls, you will need to negotiate -- particularly in tourist shops -- to get acceptable prices. You'll probably want to bring your own toiletries, sunscreen, and consumables in case the brands you normally use are not available. Beware of the many local toiletries, particularly soaps and deodorants, that contain whitening agents. Although violent crime is not really an issue on Bali, the influx of tourists does attract some petty theft. Be mindful when choosing a day bag; backpacks or satchels with popular logos (e.g., IBM, LowePro, GoPro, etc) announce to would-be thieves that the contents inside are valuable. Snorkel gear: You can rent gear snorkel gear daily when you need it. Water filters: Although the tap water is not safe to drink in Bali, bottled water is available everywhere. To cut down on plastic, use water refill machines whenever you can find them. Expensive jewelry: Flashy bling will get you higher prices and make you more of a target for petty theft. Many jewelry artists call Bali home; consider purchasing some of their beautiful work. Weapons / pepper spray: Arming yourself is certainly not worth the risk of trying to cross borders with it; leave weapons off your Bali packing list!